You think it’s hard to predict the games and standings from week to week? Try picking MVP candidates. There are five or six different candidates emerging every week. We’ll do this as one post again today and start separating them out next week. And I’m sure by this time Tuesday everything will be turned upside down again. Enjoy the games today everyone! 1. Michael Vick, Philadelphia Eagles—He didn’t play last week and yet the Eagles still won, but barely, on the road in San Fran. Against a team that still hasn’t won a game yet. And hence my case is made again. And when Kolb and the Eagles lose at home to the Falcons today, fans in Philly will be chanting Vick’s name, which will have made my case again. 2. 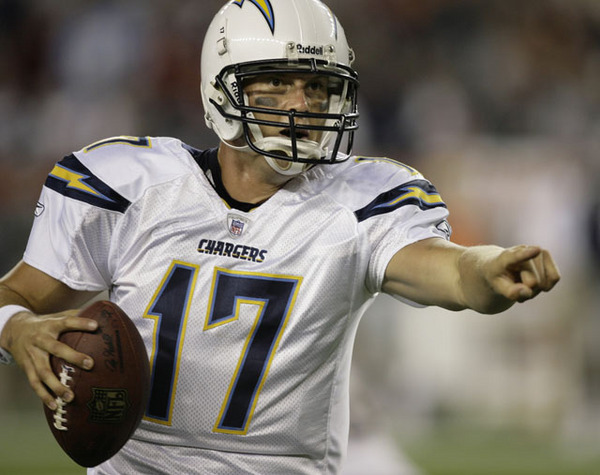 Philip Rivers, San Diego Chargers—AJ Smith took away the guy’s favorite receiver, but he keeps finding other guys open and reminding Bolts’ fans of Dan Fouts. Rivers leads the NFL with 1759 passing yards, with 11 TDs and 4 picks…but here is the stat that’s a bit mind-blowing—9.6 yards per attempt. In those who have played 5 games, Kyle Orton is second at 8.1 YPA. Wow. You fantasy geeks have got to love Rivers, and he might even get Vincent Jackson back around Week 10 or 11. 3. Antonio Gates, San Diego Chargers—Seriously, you wanna hear some sick numbers? 29 catches for 478 yards and 7 touchdowns. That projects to 93 catches for 1529 yards and 22 TDs….as a TIGHT END. Those numbers would rival Randy Moss’ 2007 season, but as a TIGHT END. Are you kidding me? 1. Mike Smith, Atlanta Falcons—The Falcons are like the Boise State of the NFC. They get no respect. Everyone picks the defending champion Saints to win the division, and picks teams like Minnesota, the Giants, Philly and even the Bears to contend for the wild card. Meanwhile, Smith has his Falcons at 4-1 and if they beat the Eagles in Philly today, everyone’s eyes will be officially open. And well they should be—this team plays hard every week and are a reflection of their fiery coach. 2. Raheem Morris, Tampa Bay Bucs—How many of you picked the Bucs to win 3 games this season, let alone 3 games in the first four? But here are the Bucs at 3-1 and battling Atlanta for the division lead. Sure, they first beat Cleveland and Carolina before getting whooped by the Steelers. But then they found a way to beat the defending AFC North champion Bengals in Cincy. You have to give Raheem props, so we’re doing that right now. 3. Tom Coughlin, New York Giants—Remember a few weeks ago, when all the Bill-Cowher-to-the-Giants rumors were hot? That was after Coughlin’s bumbling Giants fumbled and goofed their way to a 29-10 loss to the Titans despite dominating the game in stats; and a week after getting thrashed by the Colts in Indy 38-14. Then a funny thing happened…the Giants rallied around their beleaguered coach, with several of them sticking up for Coughlin along the way. They found their defense again, and last week found their offense as well in beating the Bears (3-0 before that game) and Texans (3-1 before that game) by a combined 38 points. And now Cowher is being rumored in Dallas. What a difference a few weeks makes. 1. Ndamakong Suh, Detroit Lions—No sacks last week, but 3 more tackles and a 44-6 win for his team over the Rams. 2. Sam Bradford, St. Louis Rams—Two interceptions and no scores, and see #1. But we’ll keep him on here at least another week until we see if the Lions’ game was an aberration. 3. Jahvid Best, Detroit Lions—No TDs last week, but over 100 all-purpose yards wearing down the Rams’ previously stingy defense.